(Office of Her Majesty – Press Department – Al Karak) - Her Majesty Queen Rania Al Abdullah met with beneficiaries of the Queen Rania Teacher Academy (QRTA) in Al Karak on Monday and urged them to continue their pursuit of knowledge to improve their teaching techniques. During the visit, Her Majesty stopped by Al Karak Cultural and Sport Center where she was welcomed by its Director, Akram Majali, and its Deputy Director, Omar Suheimat. At a session attended by participants of the QRTA program Teach Like a Champion 2.0, QRTA CEO, Haif Bannayan, and QRTA Program Lead, Jumana Jabr, Her Majesty listened to teachers discuss their expectations of the new program and its potential impact on their classrooms. Now in its second edition, Teach Like a Champion is a training program run by the QRTA based on a two-part book called ‘Teach Like a Champion’ by Doug Lemov. The book reflects the basis for the program, which aims to enhance educators’ instruction methods and create teaching environments that are conducive to learning across Jordanian schools. Addressing the attendees, Her Majesty lauded people from Jordan’s south for their resolve, courage, and generosity. “We wanted to ensure the launch of Teach Like a Champion 2.0 from Al Karak, in order to cater to the educational ambitions of the south,” she added. Commending residents of Al Karak for working hard to provide their children with quality education, Her Majesty pointed that this is not surprising for a governorate whose men and women have profoundly influenced Jordan’s growth. “As you know, learning tools are always evolving, and to teach confidently, teachers must persevere in seeking knowledge and continuously advance their instruction techniques,” she said. Expressing her pride in the teachers, Her Majesty said “I always feel optimistic around teachers because they are a source of so much good, and they instill hope in their students, who positively influence their families in return.” She also underscored how teachers are at the heart of the education process. “Teacher training requires the support of all competent authorities, and so does identifying, importing, and fine-tuning the best international teacher training programs to suit our culture, teachers, and curricula,” she also added. 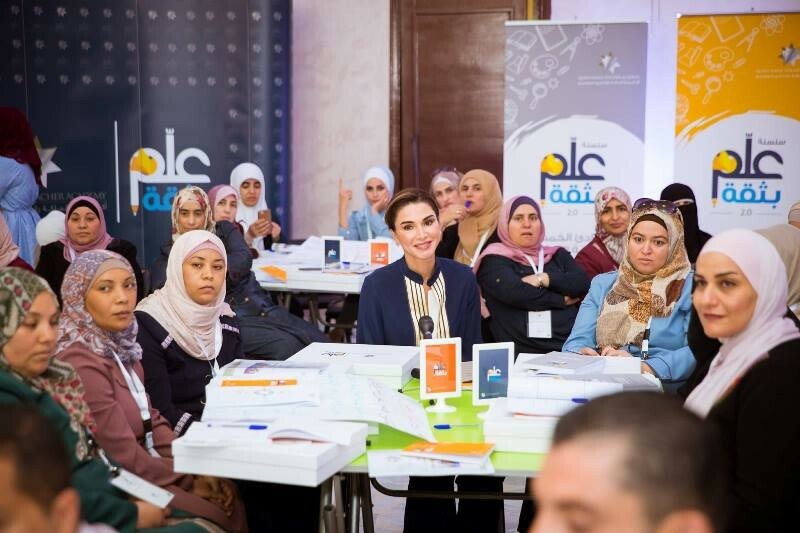 Reflecting on the successful launch of the first edition of Teach Like a Champion, Her Majesty expressed gratitude for the initiative and the impact it has had on thousands of Jordanian teachers. While in Al Karak, Her Majesty also stopped by the King Abdullah II School for Excellence, where she was welcomed by its Principal, Maysam Majali. A group of QRTA beneficiaries from the south explained to Her Majesty the benefits of QRTA’s various training programs and the impact they have had on them, their schools, and their students. Her Majesty also met with a number of students, teachers, and administrative staff. The first edition of Teach Like a Champion outlines 49 teaching techniques, while Teach Like a Champion 2.0 outlines 62 techniques, and comes with a special tool kit for applying them. The second edition compiles feedback gathered from teachers in classrooms around the world to fine-tune the techniques for daily classroom use. The Teach Like a Champion book was translated to Arabic and features techniques applicable to the region to keep students engaged and focused. Teach Like a Champion 2.0 is divided into four modules, which include check for understanding, academic ethos, ratio, and the five principles of classroom culture. Currently, the total number of trainees under Teach Like a Champion has reached 3,500 teachers from various public schools. The Arab Bank and the Jordan Bromine Company have supported the program by sponsoring 350 trainees.